It's not often my dreams come true .. thank you guys for continuing to give us what we need AND what we want - much <3 !!! 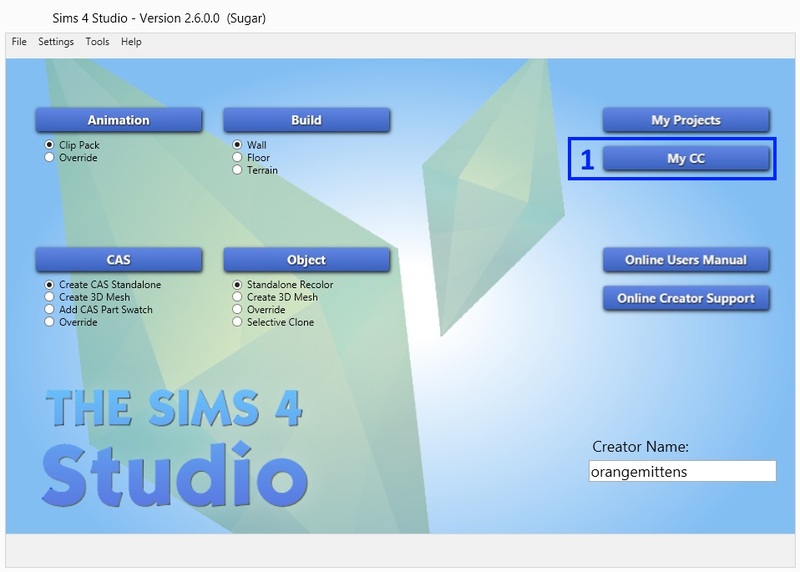 This tutorial will show you how to manage your custom content with Sims 4 Studio. 1. To get started put a name into the Creator Name box. This will not affect your CC in any way so you can enter whatever name you want. By default Studio is set to look for your game files in the typical installation location. Unless you have your Sims 4 game installed in an unusual location you can leave the path to your files unchanged. If you need to change it browse to your game installation and stop there...do not include /Mods in the path. Studio will find that folder on its own. Once you're all set click the My CC button. 2. The next screen Studio shows will have your Sims 4 Mods folder displayed in the left hand column. Until you select a piece of content to look at the right hand side of the screen will be white. My Mods folder contains 4 sub folders and all of my content is in one of those 4 folders. If your content is also inside subfolders click the small triangle to the left of the subfolder you want to look in and this will "open" the folder so that the contents are listed below the folder name. 3. If you have content in your Mods folder that is not in subfolders, or if you click the arrow to open a subfolder, you will see a list of .packages. When you click on a .package this will select it. Once it is selected the .package's contents will appear on the right side of the screen. Currently the portions of a .package that are displayed through the My CC button include the mesh, the swatch thumbnails, and the tags. The mesh will appear in the blue content view window. 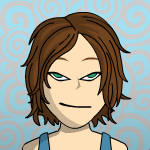 Here I've selected a hair by LexiconLuthor. I can click on the swatch thumbnails to see the various swatches it has. As I click them they are displayed on the mesh in the content view window. You can change the tags by adding or removing check marks. 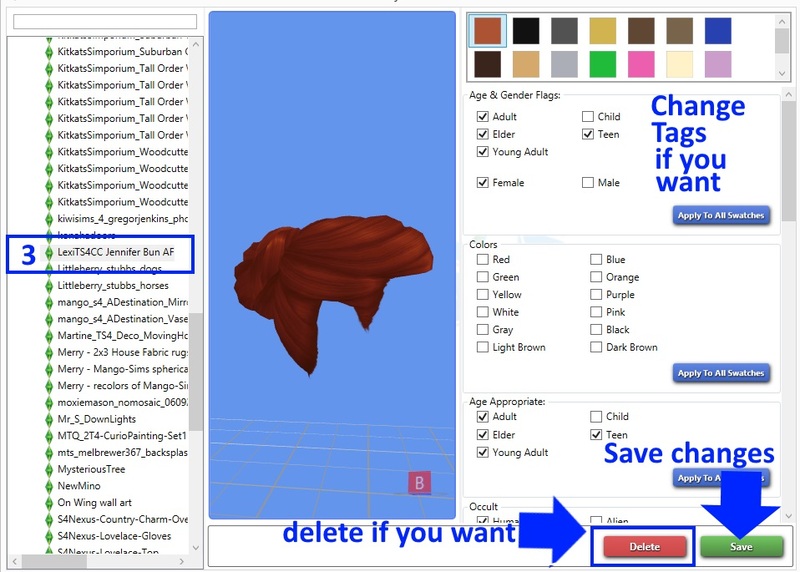 Changes that you make to the tags will not take effect in the game unless you click the Save button before selecting another .package or closing Studio. What this means is that if you are changing tags and you change your mind you can return the .package to its original tags by simply closing Studio or selecting another .package without clicking the Save button. Once you click the Save button the changes you've made to the .package will be permanent and they will alter how the item is sorted when making content searches in the game. Studio is also able to completely delete the .package from your Mods folder if you don't want it anymore. To permanently remove a piece of content click the red Delete button. Note that this is permanent. If you click the Delete button that piece of content will be removed from your Mods folder and it will no longer appear in your game. If you want that piece of content back you will need to get the .package and place it in your Mods folder again. Deletion does not require you to click the Save button after clicking the Delete button. It will immediately remove the piece of content and there is no changing your mind after Studio has taken it out of the folder. Do not click the Delete button unless you're sure you don't want that .package anymore. 4. Some .packages are merged .packages and contain more than a single piece of custom content inside them. 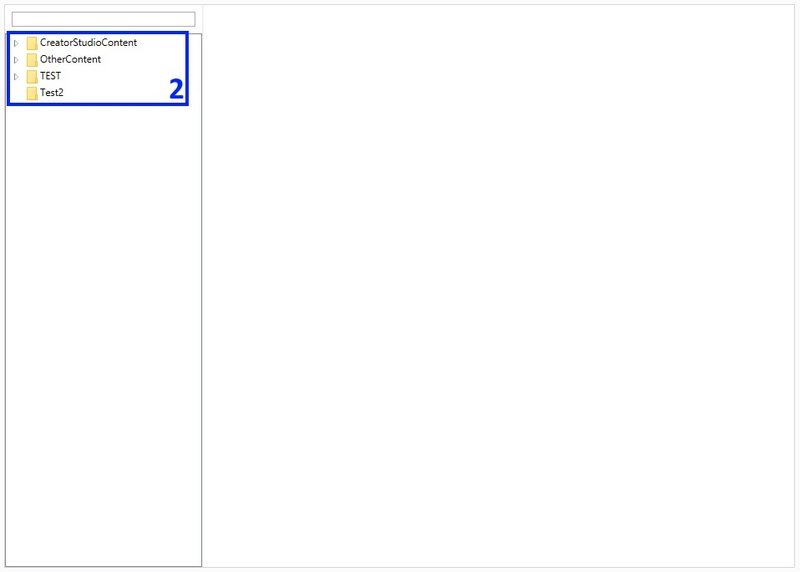 If you click on a merged .package the list of the individual pieces of content inside it will appear between the main .package list and the content view window. 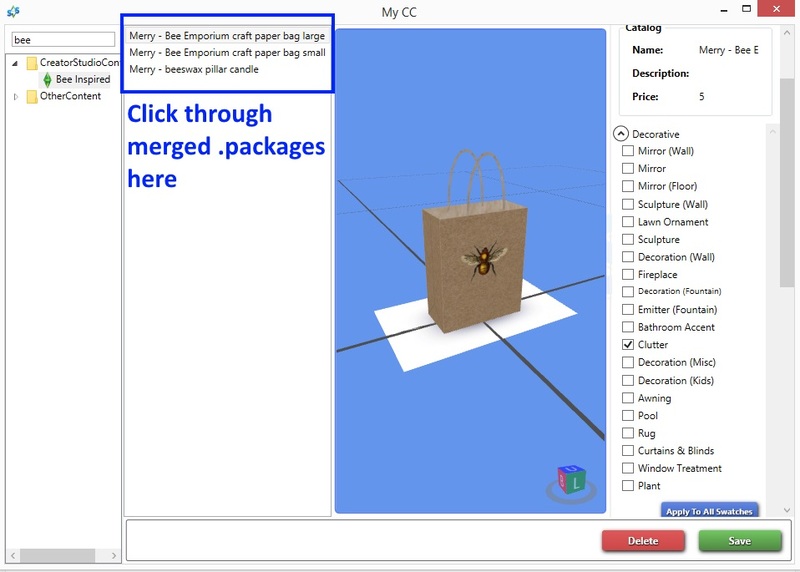 Here I've selected a merged .package of Bee inspired clutter items by Merry Sims. I can click on each of the individual items inside the merged .package and as they are clicked on they will be displayed in the content view window and their tags will become available for editing. 5. Studio has a Delete Swatch feature. To use this select the unwanted swatch and click the Remove Swatch button. This will cause that swatch to be permanently deleted. You need to click the Save button for the remove swatch to take effect. If you do not click the Save button the swatch will not be deleted. If you have accidentally clicked Remove Swatch on a swatch you want to keep click on another item without saving or close Studio without saving. The swatch you clicked Remove Swatch on will only take effect if you click Save. Currently Studio does not support the deletion of a single item that is within a merged .package. If you have a merged .package selected and you click the Delete button it will cause Studio to delete the entire merged .package not just one item inside of it. Do not click the Delete button when viewing a merged .package unless you want to delete every single item in that merged .package. Studio's custom content management feature is currently in beta testing. What this means is that it is a work in progress and the feature may have bugs. Do not use Studio to manage your custom content without first making a backup of your content. The best way to make a back up of your content is to copy all of the content you have into a second folder that you have saved on your computer outside of your Sims 4/Mods folder. If you run into a bug while using this feature please report that so Studio's custom content management ability can be improved. Im sorry this may be stupid, but how to I get the program to run? I installed it but it is just showing up as a file? I have a mac if that makes a difference... Sorry and thanks! Hi xanadu, welcome to Studio forums. Studio is designed to run on a PC. Some creators have had success running it on a Mac using Bootcamp or Parallels and you could try that. I am not certain how Studio's My CC feature will work if run that way though and no one has reported trying it. There is a post HERE that discusses how to run Studio on a Mac using Parallels. If you end up giving this a try I would be very interested in hearing whether it worked for you. Thank you very much! I'm in this for a long time already needed. Can you export items into blender from your mods folder like i wanted my sim animation to interact with the item is this possible? Thank you for this cc management feature! I'm amazed at your skill in creating and developing the Sims4studio tool. I'm ever grateful for all the hard work you've done and continue to do to enhance the game! Hi heliel22, I'm not certain what you mean...could you explain that a little more? Yes...this is possible. You would need to create the animations to go with the item and mod the ensemble so that the Sims will interact with the object and play the animation. That topic is outside the scope of this tutorial though. If you have questions about a project you've started please feel welcome to post in the Creator Help section. Awwww yesssss! I needed this! Thank you!!! Are we able to delete specific swatches of files or can we only delete the file itself?